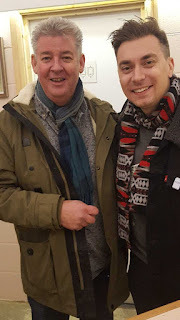 I was in Scotland last week to see off my late mother's flat - you know - help my sister with all the remaining bits and pieces and discuss old photos of goodness knows who, as not only are the subjects of the photos all deceased, everyone who knows who they were are too. 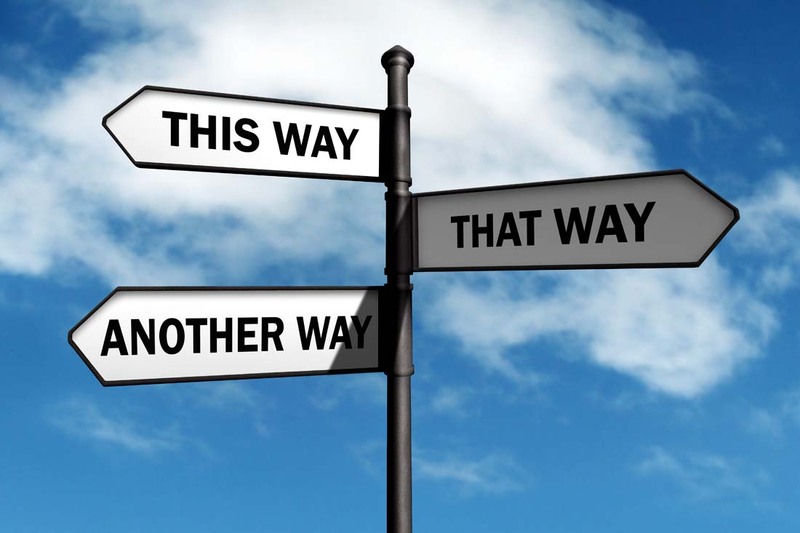 Very sobering and a reminder - hardly needed - that all paths lead ultimately in one inexorable direction. Sounds like an excuse for a drink eh? Well I certainly thought so. I started off on the first night with a visit to the Captain James Lang, our local Dumbarton JDW. Cask to me has been hit and miss in there, despite its Good Beer Guide status, but they had Adnams beer on. I like Adnams. Proper beer it is. Adnams Nut Brown Ale and rather good it was too. Typical Adnams taste and more complex than I'd reckoned on it being. A beer that made you think. Chatting with my non drinking sister, I found three pints weren't a hardship. For a proper description of the beer, see the Beer Nut here. I concur with his findings, even though these days, I'm more of a "good or shite" beer describer and as a rubbish blogger, I rarely take notes; rather I rely on my phone for photos of what I drank and my memory for how much I liked them. Not an entirely reliable modus operandi. Trust me on that one. Due to an unexpected funeral which I wasn't involved in, family plans were put aside the next day. I decided a little trip to Glasgow would fill the hiatus. Charing Cross area was just a hop away on the train, chosen mainly for the State Bar and the Bon Accord - where - and I have mentioned this before - I had my first ever cask beer in 1974. But firstly the Griffin opposite the Kings Theatre. 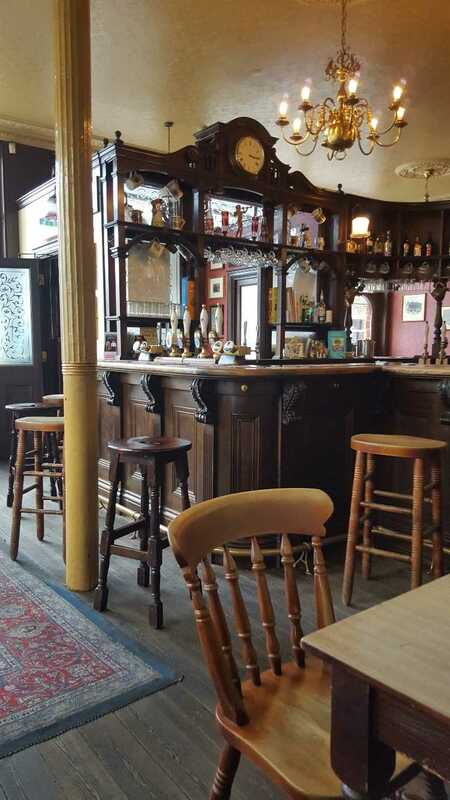 Years since I've been in there - all wood and glass with an old and comfy interior and a horseshoe bar. One other customer in only, reading the paper and drinking a pint of Tennents, so at least I knew it had been recently poured. Duly ordered from a silent barmaid - no warm welcome there - it was cold and gassy, so I swirled to release some carbon dioxide, knowing that if the pipes are clean, there was a chance to get something good from this Scottish standard. It wasn't bad after an atmosphere of CO2 was dismissed, but not hitting the mark. My solitary drinking companion left with no goodbyes exchanged. I entertained myself by watching a glum faced stocktaker, take all bottles down from the gantry and solemnly inspect by eye before noting the contents on a sheet. It was soothing stuff as he tutted his way around the bar. Finally, my pint finished, I slunk out casting my eye without success for the now disappeared barmaid. Like my erstwhile fellow imbiber, I too, left unnoticed for pastures new. Just up the road is Henglers Circus, a large, bright L shaped Wetherpoon bar, which although it has a fair bit of low level chairs and tables, would be much improved by some bench seating. It was quite pubby with plenty of folks of varying ages dotted around, chatting, eating, reading the paper or just watching passers by through the large windows looking out to Sauchiehall St, where, and this happens a lot, they were digging up the street in my honour. 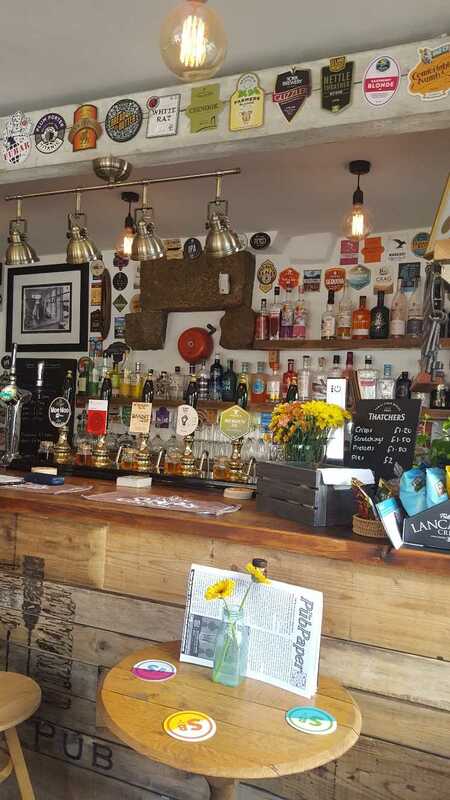 The greeting was very warm and friendly and unbidden the barman after ascertaining I wanted beer, rattled through the offerings. By way of compare and contrast, I had a very decent pint of St Mungo from West Brewing in Glasgow. I took in the pleasant atmosphere and enjoyed a leisurely people watching. I didn't have the cask, but some did and I know from past visits it is reliable enough to deserve its GBG entry. 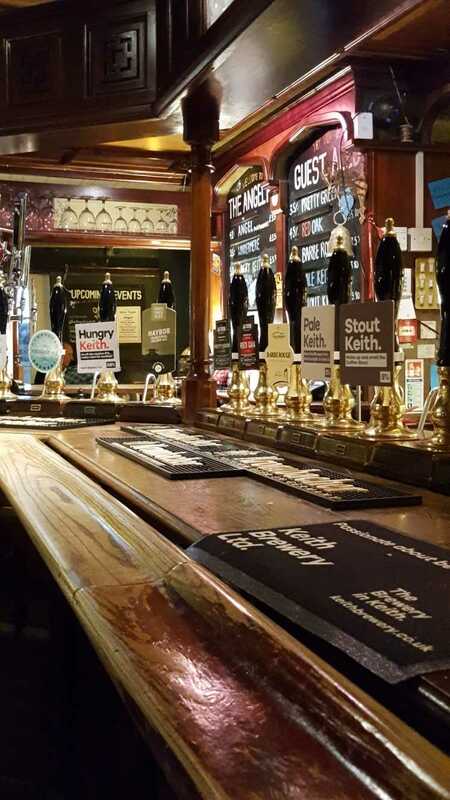 A mere hop and a skip away is the State Bar, renowned in real ale circles. Well Glasgow ones anyway. I used to regularly sup there in 1976 when I did my Supplementary Benefit training in nearby Pitt St. Then it was an all chrome and black keg bar and looked nothing like the traditional pub it is now. Odd if you think about it. Only half a dozen in and again not much of a greeting, but GBG form Fyne Ales Everyone Loves Simcoe made up for that as did bumping into an acquaintance of mine. The beer world is small really. My intended final stop was the Bon Accord just over the M8. Busy and welcoming - big smiles and hellos - and beer from one of my favourite breweries, Stringers. Yellow Lorry was in Good Beer Guide form as I was drawn into a discussion on an inadvertently locked down laptop. This widened with plenty of people offering solutions, but it still wasn't working when I left 45 minutes later. This pub never disappoints even if Hewlett Packard laptops do. Now I know you are asking yourself. "What about the Tennents?" I had intended to go back to Dumbarton at that point, but seeing a pub sign down a side street by the Mitchell library,I couldn't resist. 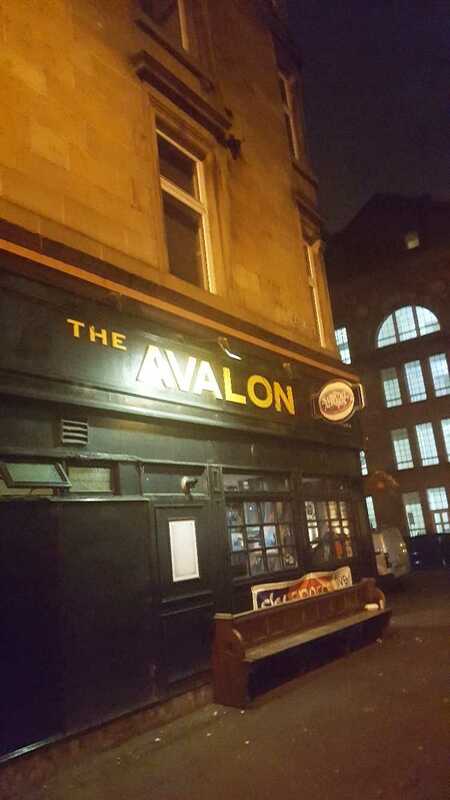 The Avalon is odd. Just check out the reviews. 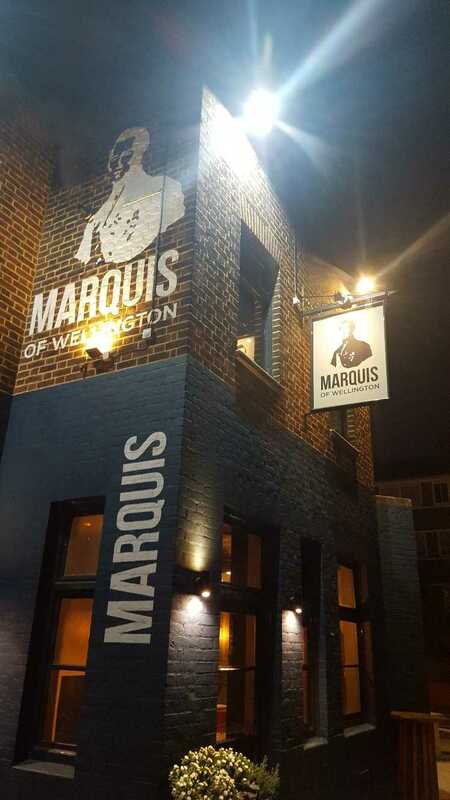 Inside, like a souped up scene from Still Game, a few denizens chatted to each other by the simple process of bawling in jokes and asides at a volume wholly incommensurate with the size of the pub. 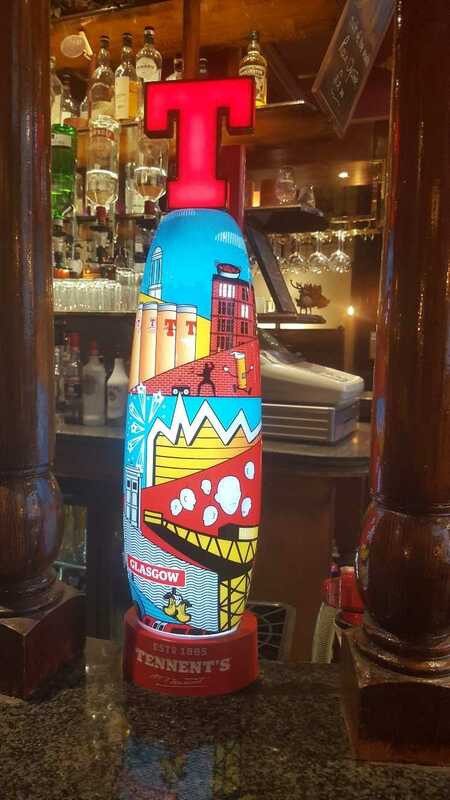 The barmaid was friendly enough and as the range of beers on offer was more than limited, I opted for Tennents Lager. It was a cracking pint. Clean, fresh and very enjoyable. CO2 levels were good and as I surveyed the slightly down at heel boozer, I felt content, swigging mouthfuls of TL and listening to the patter. Resisting the temptation for more I headed for home. Back in Dumbarton as I left the station I entered what used to be McCafferty's Railway Tavern. I was a regular there many moons ago when it was actually run by Hugh McCafferty. Many a pint of McEwan's Export was consumed in there back in the day. Now it is a recently opened Indian Buffet Restaurant called Haveli having been closed for a number of years. Now I'm not the biggest fan of this kind of eating, but it was handy and five minutes walk from home. Apart from four women it was just me, but I had one of the best lamb bhunas I have ever had and one of the best pints of, you've guessed it, Tennents Lager. The welcome was great too from the waiter and his dad who had cooked the bhuna. Tennents Lager is no Augustiner Helles, but when not over gassed it is a full bodied, clean beer with a slight ting of hops. Sadly too often it is not sold at its best. I met with a pal the next night in the Henry Bell in Helensburgh. This normally reliable GBG entry offered me two pretty undrinkable pints, though both charmingly exchanged. I reverted to gin and when the crew from RFA Fort Victoria arrived mob handed from HM naval base at Faslane, we avoided the hordes at the bar by using the JDW app. Brilliant. My last disappointment was on the way home when the Smoking Fox just outside Central Station had swapped the delicious Heidi-Weisse from West for Blue Moon. WTF? It is an opinion that some won't agree with - controversial maybe - but I've usually found craft beer bars a bit samey. 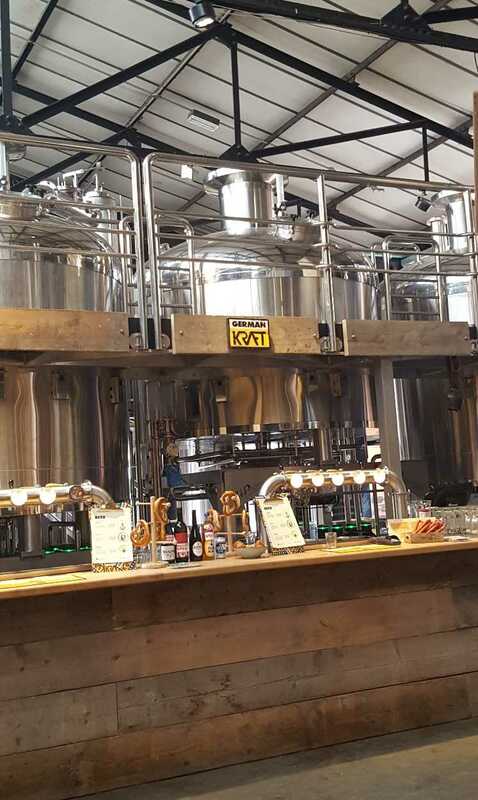 All shiny and sharp surfaces like Gordon Ramsey's kitchen; industrial chique instead of comfy decor; a stainless steel wall of taps and the barstaff's backs for a view. The Americans, as always, have a lot to answer for, as have their unimaginative worldwide copycats. Why can't we have some more craft bars with individual character? Nonetheless being a reluctant democrat in such things, I sometimes find myself in them, usually with gritted teeth and quite often wearing, if not a sulky expression, a boat that shows faintly concealed resentment. Thus it was in Malaga a few short weeks ago. I and my companions, (E excluded), had dutifully jotted down the must visit places of the crafterati and round them we traipsed. I think we went to around five. 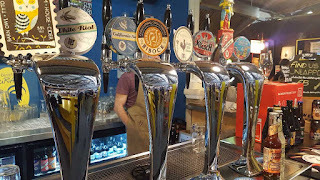 Six if you count the visually appealing Cruzcampo Brewpub, La Fábrica - a magnificent and brilliantly designed space with decent snacky food and a very shiny brewery producing slightly boring but incredibly competent and faultless beers. In each bar, the same odd tasting take offs of beer styles from abroad. A muddy pale ale, a wheat beer, an overhopped, unbalanced IPA, a badly made porter and some murky one off, masquerading as a saison or a NEIPA (interchangeable in their awfulness and who knows how they should taste anyway - the brewers clearly don't? It made you shake your head with wonder that any brewer worthy of the name would let the bloody stuff out to trade. And always, well very nearly, an amber beer that everyone tries and then pulls a face at, before wondering why brew this insipid style at all? The only saving grace really was, here and there, an Imperial Stout, so alcoholic, dark and dense that brewing faults were disguised to the point of non detectability. Was I just unlucky? Is it just Malaga? I don't think so. 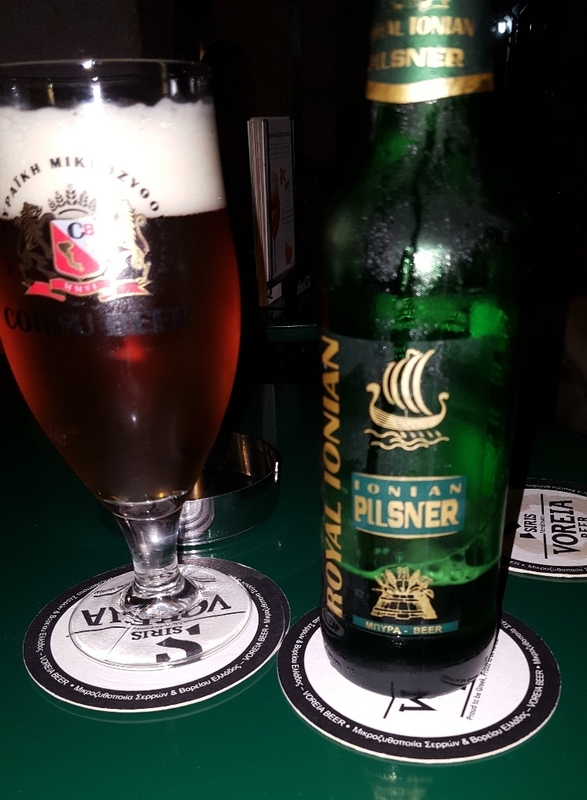 While undoubtedly more competently made beers were to be found in Barcelona with the same friends last year and without them in Berlin, earlier this one, the general samey picture didn't change. And why anyway for goodness sake, would you want to replicate abroad the experience you can find in any craft beer pub in Manchester, Liverpool, London, New York and everywhere else? It's the modern equivalent of demanding sausage egg and chips or pie and beans, no matter where you are in the world. You pay top dollar for the experience too. That at least is consistent the world over and is the one thing that can be relied on. 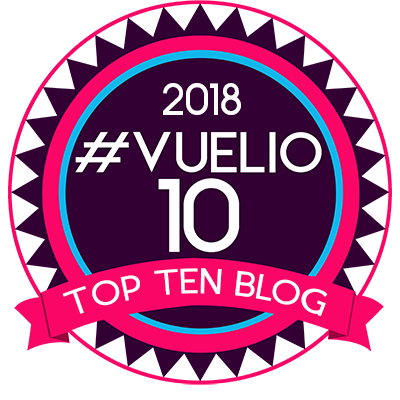 Having said all that, Malaga is a great city to go to. 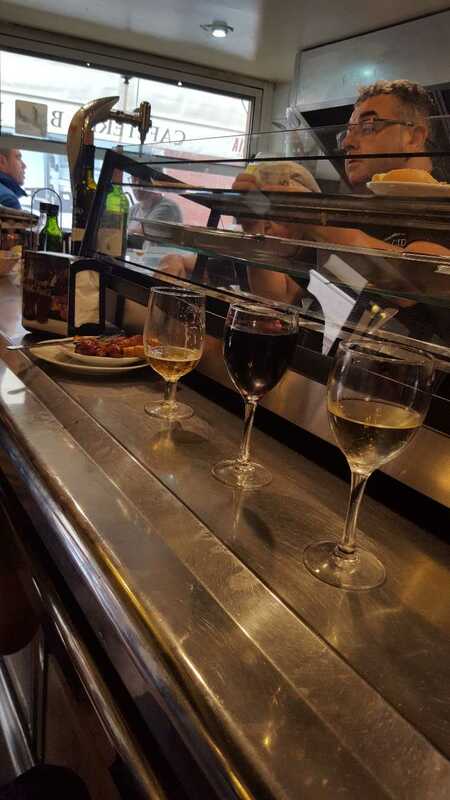 Just get to the real Spanish bars around the giant market or anywhere away from the very touristy centre and you can have a great time in traditional surroundings. El Cid by the market was small and not at all self concious. Our entry caused no wonder or resentment at all and as we perched in a corner, four little tapas were presented with a smile. Victoria beer and the house wines were damn good too. In fact cheery little bars on every corner, even on main roads in the city centre, were a feature of the town and away from other visitors you certainly got a feel for the vibrancy of them and the way they are used by locals. Welcomes were always warm too, unlike the general indifference of the craft bars. So what's the lesson? If you are a fussy old duffer like me, when abroad just visit local pubs, drink local beer and wine and mix with local people. If you want to drink craft - carry on, but don't expect it to be much different from home as an experience. Interesting too to compare basic Spanish beers. 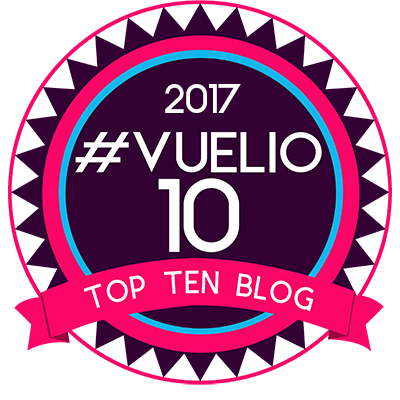 Least liked were San Miguel, Mahou and Cruzcampo, though none were bad. 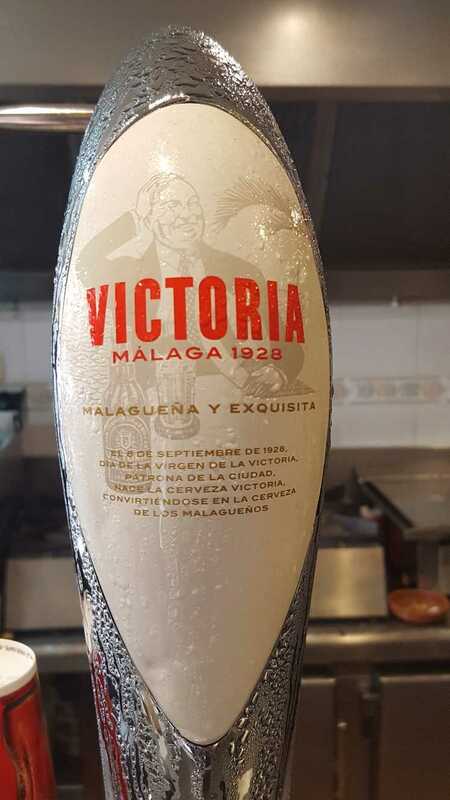 Very much liked were Victoria and the lovely and gluten free Estrella Galicia. Funnily enough in the tourist centre some excellent house wines and great grub can be found at very reasonable prices. Gambas al pil pil? Yum yum. According to the blurb Mercato Metropolitano is a "Community based Food retailer with an Italian soul that promotes sustainability, craftsmanship and community." (OK there is a needless repetition of "community" there, but hey ho, I'm not that much of a pedant.) Anyway that sort of thing is right up my right on street, so I had to go. Fortunately its location on Newington Causeway is easy to get to from my London place and even easier from where I was when I set off. Taking a break from my endeavours at the Dispensary Pub, I nipped round the corner to Aldgate Bus Sation and hopped on the 40 bus which drops you right outside the door. Lovely. Only it didn't. As I was early to meet E for drinks and a bite to eat, I hopped off a stop early and went for a quiet pint of Harveys Mild in the Royal Oak. And quiet it was too. Being mid afternoon I was the sole customer for most of my visit. But that was fine. It was rather restorative sitting with a pint and just reflecting on things. However man does not live by family brewers and inner contemplation alone, so after one, I bid my farewell and left. Confirming the bus stop was indeed opposite the entrance to the rather anonymous looking building housing Mercato Metropolitano - think cross between a market and an abandoned Scottish League 2 football ground - in I went. It was impressive. I entered through a area which sold all sorts of excellent looking comestibles from all over - but mostly from all over Italy. All looked fab frankly, particularly the bread. I'll certainly be back for some of that. Leaving by a side exit into the main body of the kirk, my eye was immediately caught by brewing vessels and the home of Kraft, making authentic German beers with proper German ownership, braumeister etc. "This should be good" I thought. I started off with the helles, Heidi Blonde, which was unfiltered. A bit chewy and grainy this, with a somewhat muddled flavour. Not bad, but no Weltschläge. Next up was the Edel Weiss, which was much more on the money. It ticked all the weissbier boxes, with bubble gum, and cloves evident, though it would have been better in the traditional weissbier glass, rather than a handled pint mug. I finished off as E arrived - from a completely different direction than I expected - thus surprising me. If I'd been a sentry, my throat would have been cut. Hopfen Kiss Pale Ale was rather a decent, just hoppy enough, bottom fermented Pale Ale. Very drinkable and probably my favourite. E didn't fancy any of the beers at Kraft - she has a deep and well founded suspicion based on bitter experience, of opaque German beers - so we set off to explore. There really is something for everyone to eat and drink here. 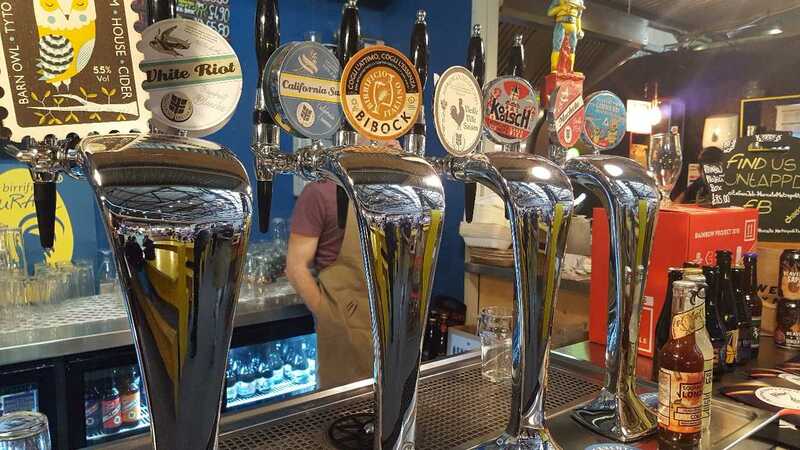 Plenty of craft beer choice, very decent wine and food from all over the world, sensibly not overlooking that staple of the traditional hipster/craftie - burgers. But seriously, good stuff abounded. By the time we'd wandered round it and it is a good size, the place which had been virtually empty when I arrived, was filling up with the after work crowd. We found a seat and ordered some beer. 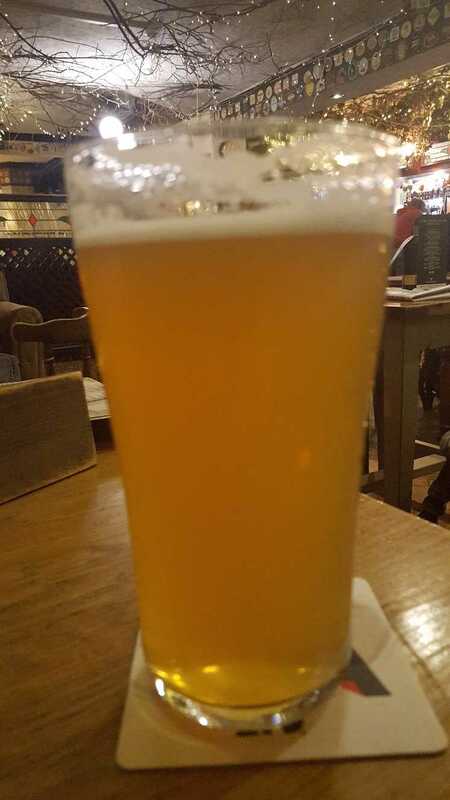 My choice, from cheery Italians (I think) was a remarkably good Das Kölsch from Howling Hops. 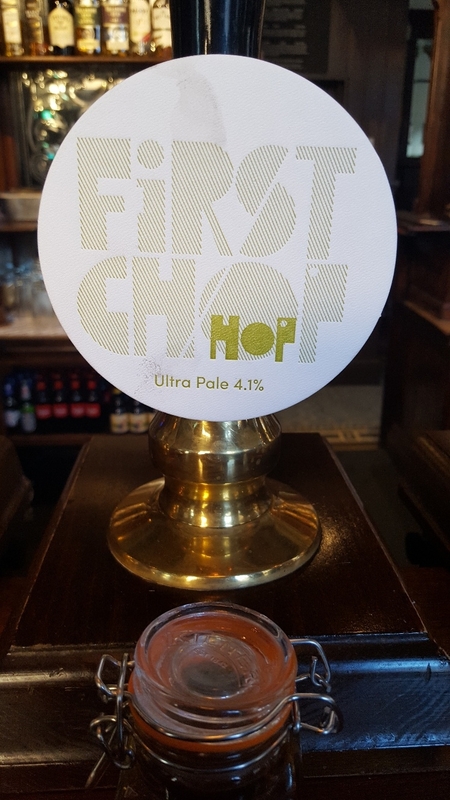 This was such a good (and rather authentic) brew that my tentative half was immediately followed by a pint, though the glassware, a non nucleated nonic, was not perhaps the best way to present such a delicate beer. E being E had a pils of some sort from an entirely different stall, which is the beauty of the setup. Again, getting into the spirit of the place, I had Vietnamese food while E hopped continents to South America. I think I had the better of that though, which is rarely the case. This is a seriously good place to visit. We will certainly be back and I now know I must visit Howling Hops soon. That Kölsch was good. Handily the 40 bus is outside on both sides of the road, though road works made our return to Aldgate less handy. Only complaint is that your clothes are likely to smell of cooking after a couple of hours. There is a lot of it going on, but that's a small price to pay. 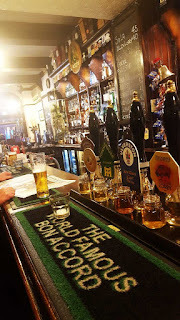 Readers of this blog know I have shall we say, some issues in finding top quality cask beer in London. It always puzzles me why. Apart from the obvious antipathy to keeping cellars at the appropriate temperature of course. I get that. Not why they don't, just the fact that they don't. Let's be quite clear here. Too high temperature buggers up cask beer. You start off wrong and there is no way back. Chemistry and all that. I've been down in London helping my friends Annie and David with their beer festival at the Dispensary in Leman St. It's my local when down here and though not far away at all from Tandleman Towers South, it isn't the nearest pub, but it is the one where the beer is kept properly. The cellar is kept at around 10 -12C and the beer is properly conditioned. Even without a sparkler, it sparkles. 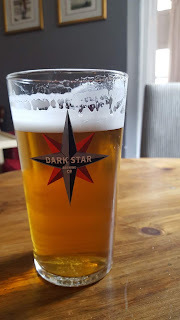 Just look at the photo of London Brewed Dark Star Hophead. Perfect. I've looked after the stillaged beers in the bar. They are cooled and could do with being a little colder - but that's just me - I'd much rather have colder. Beer warms up. Customers have been fine with them and the beers are in great nick. How? Simple. Keep the bloody condition in them. Avoid soft spiles for a start. Most modern beers don't need them and they bleed condition. Porous hard spiles are the cellarman's or indeed cellarwoman's friend. Keeping cask beer is not, despite what some would tell you, difficult. It just needs common sense and a little know how. As long as you follow a few basic rules that is. They all begin with C. Cleanliness, condition and cellar temperature are the basics. The other is somewhat contrived, but is chronology. Time. Rack the beer to settle. give it a day at least. Vent when the beer has rested. Know when the beer went on and when it ought to be sold by. 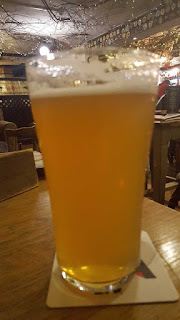 Nobody wants knackered beer and that can happen even if otherwise the basics have been observed.There is a bit more to it of course, but follow these guidelines and experience will provide the rest - or the questions that you need to ask. The final C is for check. Check the beer before serving and at intervals. The last person that should find out a duff pint has been served is yet another C. The customer. Reckon you can't afford to keep your cooling on? False economy. Put a few more pence on a pint rather than do that. Fullers seem to have done a smashing job matching Hophead at Chiswick. Well done on that one. I was invited to take part in an impromptu tasting of old beers behind our bar at GBBF. I use the term "old" deliberately. These weren't "aged" beers in the sense that they hadn't been kept carefully in a cellar, or some such controlled environment, with a view to tasting them at a later date. Instead, they had come from God knows where and ended up in a CAMRA stall at the beer festival. The carefully controlled conditions they had endured are unknown, but most likely consisted of years of neglect somewhere or other, before ending up being donated to CAMRA, where the most controlled environment waslikely to be a cardboard box on a non temperature controlled warehouse shelf. We wondered if we were in for a gourmet vinegar session and as the first bottle, M&B Centenary Ale from 1979, was opened with not a hiss, we feared the worst. To our surprise, the beer had loads of carbonation and was as clean as a whistle on the palate. Sherry and dark sugar notes dominated in a good way. It was perfectly drinkable. One of our company remarked that this bottle of beer was brewed long before he was even a twinkle in his dad's eye. Sadly I couldn't say the same, even if then, by way of compensation for that melancholy thought, I had a lot more twinkle then than now. Our next bottle however wasn't quite so good. Centenary Ale from Home Brewery of Nottingham hadn't endured the years as well. Brewed in 1978, it was still conditioned but exhibited distinct marzipan flavours, as well as considerable stale cardboard notes. You can't win 'em all. Our next two were really rather good. Both were well carbonated and again showed rich sherry/port like notes. Both were brewed to celebrate the marriage of Prince Charles to the late Diana Spencer. Royal Wedding Ale (1981) from Bourne Valley Brewery was first of the final pair. This was rather a nice bottle with a fired on label. Plenty carbonation again in this one, from a brewery which was then only three years old. 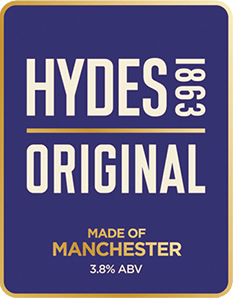 (Brewing started in 1978. but, sadly, brewing ceased in October 1985 following a split in the partnership behind the brewery.) We finished off with Celebration Royale from King and Barnes. King and Barnes were taken over by Hall and Woodhouse in 2001 and the Horsham Brewery closed. They must have known what they were doing though, as this may well have been pick of the bunch, though it mirrored the M&B in many ways with its rich fortified wine flavour. This was an interesting little interlude and it was good that the surprises were mostly pleasant. Why not have a root through your cupboards? You might just enjoy that old bottle that you find, but even if you don't, you are drinking liquid history. 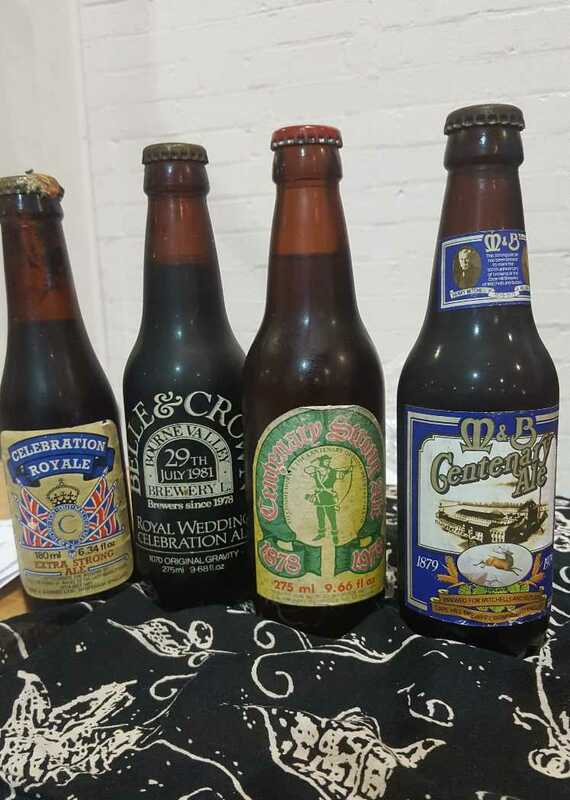 Our host my colleague Ian Garret sourced these beauties for around a pound a piece from the CAMRA memorabilia stall. I have quite a few old bottles at home. One day maybe. Cain's to Return to Liverpool? 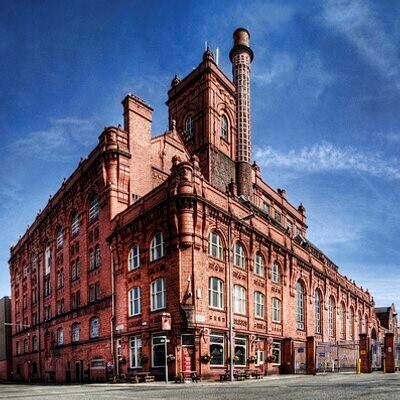 Readers of this blog will recall that Robert Cain, based in the old Higson's Brewery (itself the original Cain's Brewery) in Stanhope St, Liverpool, closed under somewaht of a shitstorm in May 2013. See the Liverpool Echo here for full details. 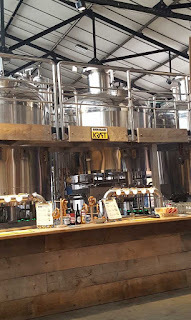 Suffice to say that the Dusanj brothers who bought the brewery had a somewhat chequered career in brewing and pub running, but finished with an idea of turning the Stanhope St site and its historic Grade 2 listed brewery into a "Brewery Village" with a hotel, beer hall and whatnot. This never happened, though there is some beery activity on the site on a small scale now. Now it seems it will. Local entrepreneur - well Rainford, but that's close enough - Andrew Mikhail, has taken the plan forward and in a £7 million plan, agreed a deal with owner (I think) Sid Dusanj to take over the Cains brand and bring forward his 15,000 sq ft scheme on three levels of the original Cains Brewery building. Plans include a craft-brewery with cask and keg beers, an Altrincham-market style venture for artisan food & drink lovers, and a state of the art sky bar. In addition, another bar with capacity for 120, already named as The Quarter Hoop, plus a brewery hall housing 400 guests will sit alongside the existing Brewery Tap and the Punch Tarmey brand (part of Mr. Mikhail’s existing portfolio) that will operate on the other side of the brewery. The building is wonderful and I for one certainly hope this all comes to fruition. There are already many reasons for the beer lover to go to Liverpool and hopefully, fingers crossed, this will be one more. The revival of the Cain's brand is interesting, with Higson's (without the famous bitter, already revived), history is being recreated in Scousley. Wonder if the Dusanj brothers are getting a cut? Who will own the site? Dunno, but watch this space. I read, with a great deal of interest, Mudgie's article in response to one by Boak and Bailey referred to on Twitter and linked. The subject, paraphrased, is dodgy pubs. Now it has to be said that Boak and Bailey aim their piece squarely at the (American) visitor as it was published in All About Beer Magazine, but there is more than a grain of truth in their observations, summed up in this paragraph, which Mudgie quotes. 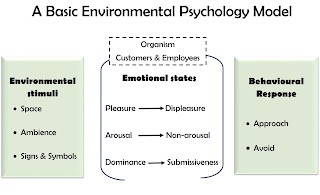 It is necessary for me to do the same as it provides context. 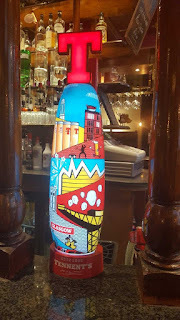 "But if you wander into side streets, the outer suburbs, or into the shade of concrete tower blocks, you might still come across the kind of pub where it is possible for an innocent abroad to get into trouble. There aren’t many exterior clues other than a general state of disrepair, although with experience you develop a kind of sixth sense based on the state of the curtains or some subtle hint implied in the signage." Like my colleague Pub Curmudgeon, I too have been visiting pubs where I'm not known for over 40 years and like Mudgie, I have had few problems in so doing. 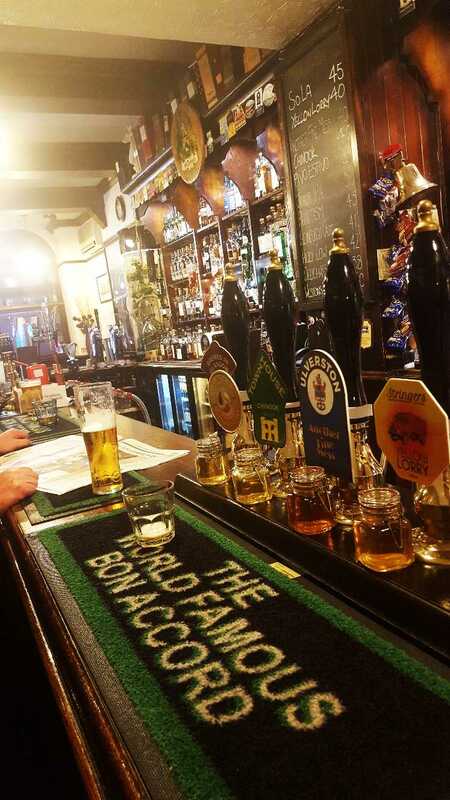 Of course, to some extent in terms of pubs, you do develop a sense of impending danger and are able to quietly slip away before anything difficult to deal with occurs. I agree too that as you get older, you present no real challenge to those with the potential to do you harm at worst - or alarm - which in itself is bad enough, but likely more difficult to deal with for the foreign visitor, who is already struggling to understand both culture and nuance. I did relate on Mudgie's blog, a little story of my time in Liverpool, when I was once physically attacked, though then as a fit football playing young man under 30, I was able to shrug off my attacker, though not the locals who grabbed me and chucked my out on my ear, but no more than that. In recalling this incident, I looked up the name of the pub concerned (The Newstead Abbey -see photo from Google) as memory had faded. In doing so I came across this fantastic review of what was my manor. It talks about the pubs I used to visit frequently, most of which are closed. It concentrates on Smithdown Road in Liverpool 7. I lived 100 yards from that road, though most of my local drinking was done in the parallel roads and back streets. Nonetheless, those were pubs I visited frequently and usually with great pleasure. The bus went from Smithdown Road, so it had that handiness too for a quick pee when returning from Town, or a swifty on the way there. Do read the linked article. 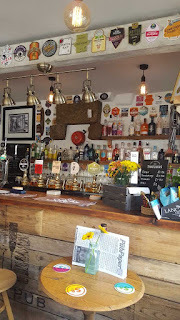 It hints at a pub life that has faded away to a large extent and in its observations, suggests I think, about why the beleaguered remainder may not be as welcoming as I can assure, most once were. I think that the Newstead Abbey has now closed. My own local, The Earl Marshall a mere 100 yards away was still open fairly recently, but who knows now. The writer of the other article speaks of his dislike for the New Campfield. Me too. Unlike the rest (Mulliner excepted - ) it was keg. Whitbread of course. The photo is of the Mulliner which was a Tetley pub which sold "Drum Bitter" or keg. It was a nice boozer inside and very welcoming, but was called something else then which I can't remember, but everyone called it the Mulliner.. When it comes to how you best increase the viability of pubs and to a lesser extent how you make your venue more attractive to the diminishing number of pub devotees, one aspect that is overlooked when suggesting themed evenings, upping the food offer, serving cream teas, breakfasts, or using it as a venue for the local slimming club or the like, is simply getting the staff to smile, or even, horror of horrors actually talk to customers. I may have mentioned this before - of course I have - I'm always banging on about it - but as someone who was trained properly in how to act behind the bar it always amazes me that this simple and cheap aspect is largely overlooked. Last week three of us were served (separately and at different times) by the same "Shift Leader" in a local JDW without the server actually looking any of us in the eye. She did though manage to conduct, simultaneously and not without a deal of dexterity, an apparently more satisfactory and enjoyable conversation with her colleagues standing at the drinking side of the bar, who had just finished their own stint on the staff side of it. So, on the bright side, she did know how to do it, just it seems, not in the context of her job. Simple things like "Hello" when you arrive and "Thanks" when you leave, an assuring "I'll be with you in a minute" if the bar is busy, are easy to do, but make a massive difference to how the customer perceives the place. It can literally can be money in the bank. If somehow staff can be taught to parrot annoyingly "Is there anything else?" as if dealing with a chronic amnesiac, then surely the odd greeting and goodbye can't be beyond them? As for the meaningless "You all right there?" 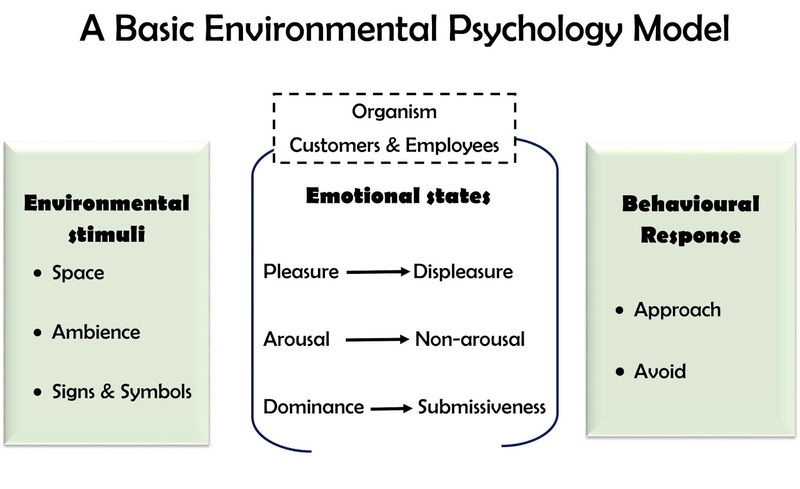 well, I covered that one here years ago when it was in its infancy, but it goes on still, and still grates as much. Try unambiguous "Can I help you?" or "What can I get you?" Trust me it will annoy the customers a lot less, especially grumpy old bastards like me, though of course like all customer facing jobs, you need to adapt your approach according to the situation. But it wasn't last weeks JDW encounter that prompts this. On last weekend's trip to Hull and Beverley, it was noticeable how the staff in that neck of the woods, despite hoards of people - including our busload arriving more or less at once at one or two places - all seemed to be pleasant, interested and helpful - often unpromptedly suggesting pubs, or joining in conversations to give directions, or asking where we came from. I don't recall one "You all right there?" Well done to all. Unless of course it was the sunshine that made them smile? Can't see it being that though surely. They were stuck inside. Got a couple more tales to tell from that weekend of unbroken sunshine and indeed fairly unbroken boozing. I also went to Nellies in Beverley. A Sam's gem. You'll all know it of course? 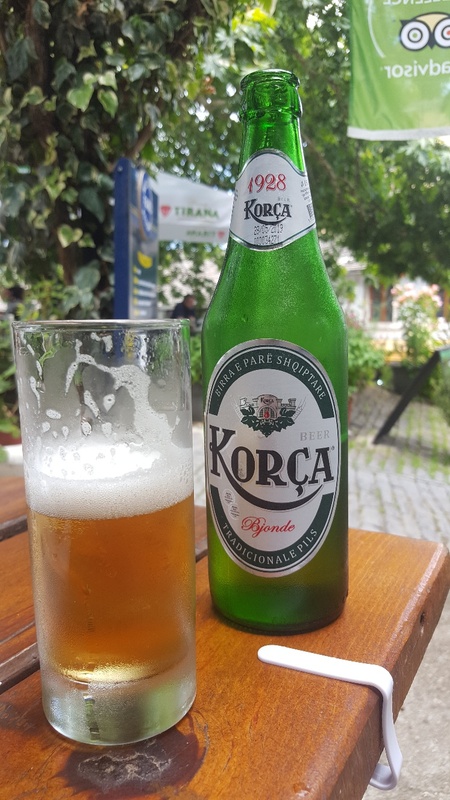 I've been away and busy with some personal matters, so while the odd Twitter comment kept me in touch while dodging rain in Dumbarton and Albania, I have spent a little time since returning, catching up with what's been going on. 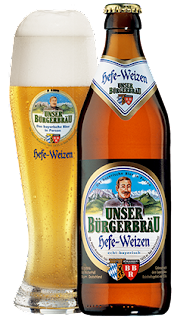 The main chatter is about brewery takeovers - well nearly takeovers in this case. The airwaves are being choked by the dreadful news that one (more) of the darlings of the crafterati has fallen off the shining path and found itself in the arms of, in the eyes of some at least, an unsuitable suitor. Yes folks, it's the Beavertown Show. Now reading blogs and other social media, there is lots of righteous indignation as well as a smattering of insight and pragmatism. You'll have, like as not, read most of it already. Frankly I can't get too excited about it. I've only ever had the odd Beavertown beer and now, if predictions are to be believed, I'm likely to have much more of it available soon as the unsuitable suitor (Heineken) makes it widely available, but at a much smaller price. Not exactly a losing position for most. Unless the recipe changes, but that won't happen, will it? Of course takeovers are nothing new. In my time as a beer drinker I've seen many of them. The usual thing is that it will be good for consumers. Economies of scale, a bigger organisation helping out where needed and of course, the beer will be matched. It won't change. No Siree. But of course, change it did. Or it disappeared altogether. So there is precedent, though then it was outlets (pubs) the predator was after, but now it is brand and volumes. The fundamental reason remains the same - to protect and increase market share - whether by acquisition and absorption - or by owning the production one way or another. Elimination of the opposition is the name of the game I reckon. Mind you, in a lot of cases in the bad old days, it wasn't usually a marriage of convenience, but a shotgun wedding, the bride having been knocked up by the suitor by way of a hostile takeover. Nowadays, the complaint seems to be that the bride was busy behind the scenes prettying up for marriage and making herself a "catch". Same outcome, but usually given the ownership, a willing partnership. Having read quite a few comments, I'd recommend Roger Protz's take. He's seen it all before and I reckon he has the right of it. My comment on Twitter and Roger's response is reproduced below. Thanks. Well put: "Look at the history and follow the money." A final thought from me. Business is business, though the ambition to build something called (slightly pornographically) Beaverworld is given as the reason for this. Oh and a shiny new 270,000 barrel brewery as a competitor might well explain the outrage by some. In the real world though there is still plenty decent beer to go at, so move along. Nothing much to see - for the time being at least. Another thing to catch my eye is the carbon dioxide (CO2) shortage. 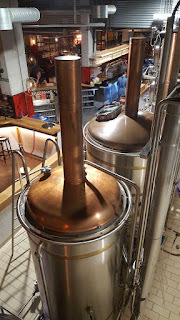 CO2 is needed in reasonable sized breweries for many things other than injecting it into beer, so it might affect some of us a bit. I think though this is more good headline stuff than a real worry. CO2 will be back in a gas bottle near you soon. Right.That's under my belt. Think I'll go to the pub tonight and see if the Beavertown is on offer yet. Two beers that both required CO2 are shown to illustrate this article. One is craft and was reassuringly expensive. The other was Albanian and therefore wasn't. I do feel the pain of some. My beloved Higsons Bitter has gone forever. It still hurts. I was struck recently by the tweet below from blogger @Super Crushy about that vexed old subject, beer clarity. I've been getting the occasional twinge and thinking I need to write something in response to all the people bemoaning the lack of clear beer and then I remember that I wrote this two years ago. I think people should focus their efforts on highlighting badly made beer, rather than just complaining about beer styles they don't enjoy. No argument there but I quite like responding in kind to your proselytizing. 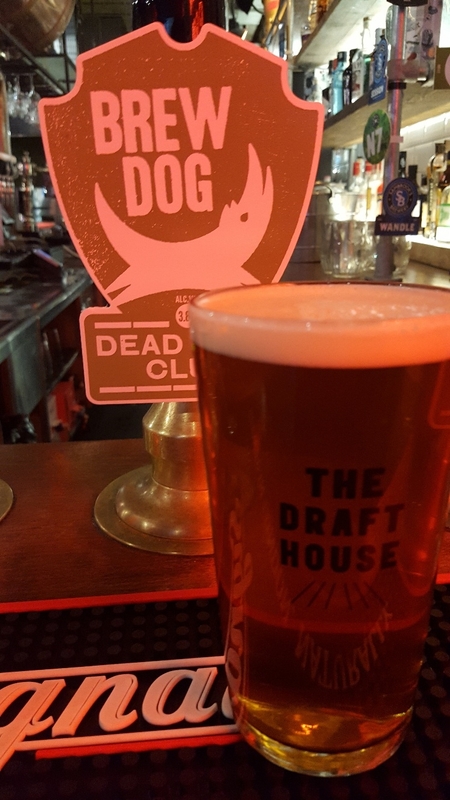 If I may quote Pete Brown about the current state of cask beer "Cask ale’s health has recently gone into severe decline. Over the twelve months to February 2018, and in the twelve months before that, cask volume declined by over 4% each year – that means almost ten per cent of the entire cask market has vanished in the last 24 months." 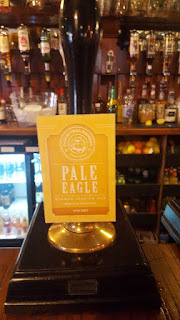 I have been banging on about the quality of cask beer at the point of dispense for a long time now and as cask ale declines (the battle isn't won - if you think it is, stop reading now) so my question is this. 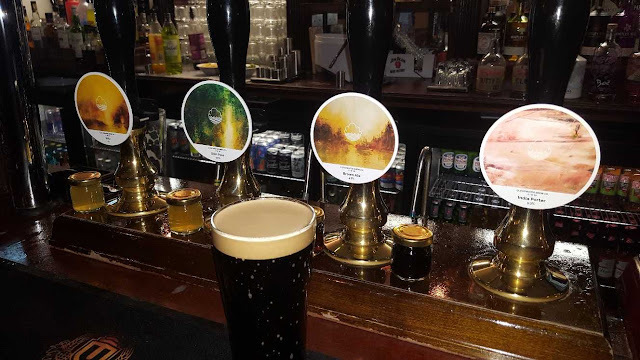 Does the confusion sown by murky beer, often unlabelled as such, help or hinder the fight for quality cask beer and the need to find more people to drink it with confidence? This isn't a pop at Super Crushy. She is entitled to her point of view and in fact is hardly alone in finding nothing unacceptable in beer that isn't clear. I merely wish to point out, as a veteran cask ale drinker, one aspect of the law of unintended consequences, though equally, I don't suggest that the decline in cask beer sales is entirely down to intentional murkiness. I do suggest, whatever your personal taste and whatever it does or doesn't do for craft beer, that it doesn't help the cause of cask beer much at all. What do you reckon? At one time if beer was hazy/cloudy, it was sent back. Both sides knew the score. This was an accepted norm which has now been overturned and not I'd venture, without disadvantage. Sorry about the rogue bullet point. Can't find a way to get rid of it.